Without question, Jeep Wranglers are celebrated for their off-roading ability and all-terrain mastery. But, perhaps as important, driving a Jeep Wrangler makes a statement. The style of a Jeep Wrangler is unmistakable, backed by a legacy of true grit. The Wrangler came to fame on the battlefields during World War II, but almost as soon as the civilian version was released, the Wrangler become a seriously sought after vehicle. Consumers in the market for a used Jeep Wrangler are presented with a unique opportunity. The Wrangler is arguably in its best generation right now and has been for nearly a decade. That means anyone looking for an exceptional used version is in serious luck. First released in 2007, the Jeep Wrangler JK body style rolls on into 2017. This generation has been refined to feature the best Wrangler capability, with an added emphasis on comfort and custom style. One of the best – certainly most fun – aspects of purchasing a Jeep is the number of options and opportunities consumers can explore in order to customize their ride to best rep their own personalities and preferences. However, when shopping for a used variant, the choices can be somewhat limiting, although it’s always possible to modify your used Jeep Wrangler upon purchase. But, when it comes to purchasing style straight out of the gate, you’d do well to track down the Moab package on your used Wrangler. Introduced in 2013, the Jeep Wrangler Moab sent the style quotient over the edge and remains a highly sought after package. 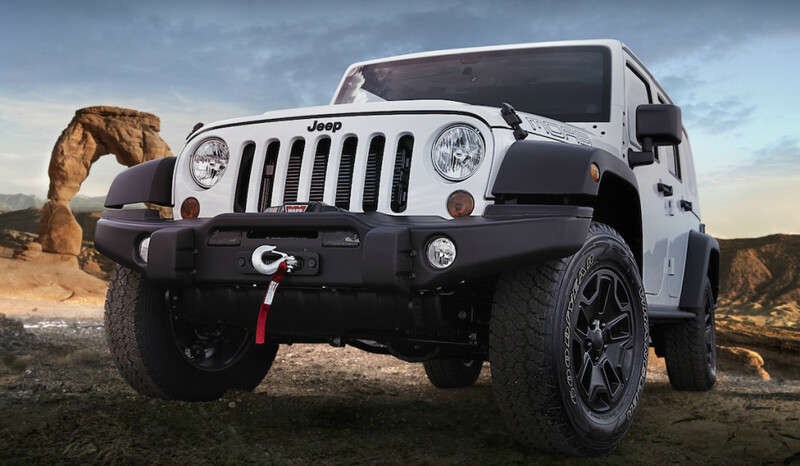 Other features of the 2013 Wrangler Moab are an anti-spin rear differential, with an available electronic locking unit, upgraded front and rear bumpers topped by integrated tow hooks, with a space for a winch if so desired. All-terrain, 4×4 power comes from the 3.6-liter Pentastar engine, celebrated for its enhanced refinement and boosted strength, as compared to the previous 4.0-liter inline six cylinder. Generating 285 horsepower and 260 lb.-ft. of torque, standard operation is provided courtesy of a six-speed manual transmission; however, drivers can opt to pair their Pentatstar with a five-speed automatic transmission. Either way, fuel economy ratings hover around 17 mpg city and 21 mpg highway. Returning to the subject of style for a moment, the Moab’s exterior color palette boasts shades like Black, Bright White, Crush, Dozer, Gecko, and Rock Lobster. In other words, styling cues that simply can’t be missed on the road or trail. Drivers can choose which of these options best complements their personality and take on the Jeep wave. Starting MSRP originally listed at $33,095 for the two-door, $36,595 for the four-door. Of course, depending on how it’s ultimately equipped, a 2013 Jeep Wrangler Moab tops out over $40,000. Just ask Korzeniewski, who tested a Moab priced at $41,325. When it comes to getting more bang for your buck, Jeepers looking to score a Moab’s moxie, but also save some coin are in luck. With nearly four years since Korzeniewski’s week wrangling his Moab, there are plenty of used versions available on today’s market. When you’re ready to track down your used Jeep Wrangler Moab edition, or any other special edition used Wrangler, the team at Cherner Brothers should be your first stop. Expert at pairing shoppers with their dream vehicle, customer satisfaction at Cherner Brothers is a guarantee – as is financing. Owing to its small size as a family-owned and operated dealership, at Cherner Brothers, flexible financing is the name of the game. Used vehicle shoppers will get the financing necessary to secure a used car, truck, or SUV, no matter their credit scores or budgets. Routinely featuring deals and specials on preowned inventory consistently proves the Cherner Brothers’ commitment to its customers. Touted as the “most friendly car dealership in America,” Cherner Brothers, as a business, has a great deal in common with the iconic Jeep brand. Based on its own legacy of operation, spanning more than 45 years, Cherner Brothers planted roots in the Baltimore area and continues to grow its reach and flourish, thanks to the support and patronage of its community. Located at 10566 Metropolitan Avenue in Kensington, MD, Cherner Brothers is easily accessible from I-495, 185, and 193. This convenient location is further enhanced by Cherner Brothers’ flexible hours, designed to satisfy your busy schedule. Open Monday-Friday from 9:00 AM – 6:00 PM, with Saturday hours from 9:00 AM – 4:00 PM, Cherner Brothers is closed on Sunday, out of respect for family time, both for employees and valued customers. Give the team at Cherner Brothers a call today at 240-731-5491 and get your used Jeep Wrangler shopping experience started the right way.